NOSE: Quintessential Russian Imperial Stout. Big, dark-roasted malt aroma. Big, molasses and chocolate aroma. Big, ground espresso-bean aroma. Big, citrus and grapefruit hops aroma. Big, nose-singeing alcohol aroma. The key word here? Big. TASTE: Rich, lush and full. Lots of delicious sweet chocolate and malt flavors up front which are quickly overtaken by a surprisingly aggressive hop profile. The finish has plenty of alcohol bitterness, but it’s held in check by the bold malt and hop profiles. MOUTHFEEL: Very full. Luscious and thick. This is a beer to be eaten with a knife and fork. DRINKABILITY: It seems like a sipping beer, but every time I pour one, I end up quaffing about half in the first gulp. It’s a brilliant stout…complex and bold. One of the few Russian Imperials that you can drink all night long….or as long as that nearly 10% ABV will let you. RATING: 3.5 Hops. Could be a 4 Hop brew, but Great Divide has some aged Yetis that are even better, so I had to leave some room for improvement. 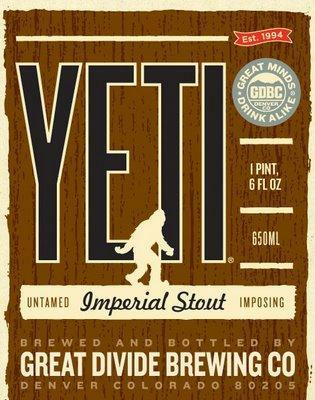 Posted in Tasting Notes.Tagged Great Divide, Imperial Stout, Yeti.